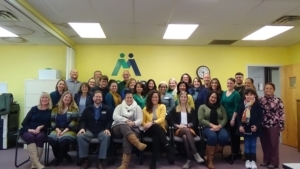 Since 1996, the MassHire Holyoke Career Center has been serving the workforce and economic development needs of individual job seekers, business partners, and community and faith based organizations throughout Hampden County and beyond. Chartered by the Regional Employment Board, the Holyoke Career Center is known for its exceptional customer service, innovative programming, creative problem solving, and an entrepreneurial “can do” attitude. We transform the maze of complex, bureaucratic Employment and Training Programs into one seamless service delivery system for job seeking and business customers alike. And we keep our sense of humor while we do it! The MassHire Holyoke Career Center is not a staffing agency nor are we a recruiter. We are a private, stand-alone, not-for-profit corporation fueled by a combination of federal, state and private funds. Working closely with many community partners, we represent the best the career center system has to offer. We have won national awards, including the One-Stop Career Center of the Year award from the National Alliance of Business and The Career Center/ Community College Collaboration award from the National Association of Community Colleges. Our mission is to develop a strong workforce system by enhancing the competitive strength of companies, improving the skills of employees and jobseekers, and expanding career opportunities through economic development.